I woke up feeling refreshed today after a good nights sleep, ready to explore the city! First stop was a local convent where you are able to climb (via some very dodgy stairs) up to the roof for some great views of the city. There was also a crypt where families used to store deceased members bones in boxes which reached from floor to ceiling in all the rooms. After the convent we headed across town to a small restaurant which is very popular with locals serving traditional Bolivian food. There are only 2 dishes on the menu, a pork dish or their special volcanic soup. 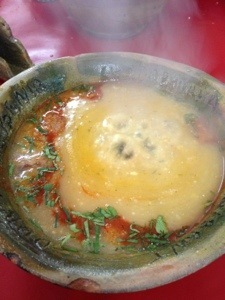 We all had the soup which came out with a hot rock in the centre which caused the soup to bubble and spit like a volcano. It was really tasty. After a browse round the shops, I then went for a tour of the local beer factory which produces Potosina beer. It was really interesting to see how they produce everything and mostly very manually. Even though the tour was in Spanish I just about followed what Jose, our guide was saying. 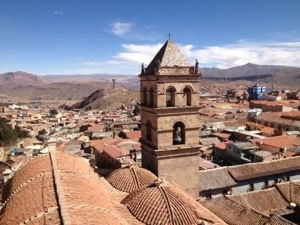 This entry was posted in Bolivia and tagged Bolivia, G Adventures, Potosi, south america, travel. Bookmark the permalink.